New for January 2013! There are many ways to skin this cat, we will start with the two simplest ways. If you have any comments please send them our way and we will make additions/corrections. Transitions can be very expensive ($1000!) but you can always buy used equipment on Ebay and there are reputable suppliers that specialize in used waveguide components (often located next to the twin microwave "rust belts" of California and Massachusetts). 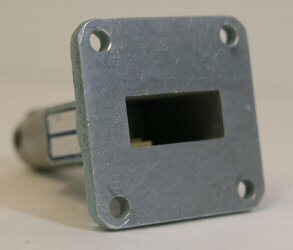 Who would want to make their own waveguide-to-coax transition? Members of the ARRL are often on a tight budget, and prefer the accomplishment that comes as a do-it-yourselfer, so our two references below are both Hams. In any case, all microwave engineers ought to know the theory behind this critical element that is used over and over again in systems and lab equipment, so get busy and read this page. 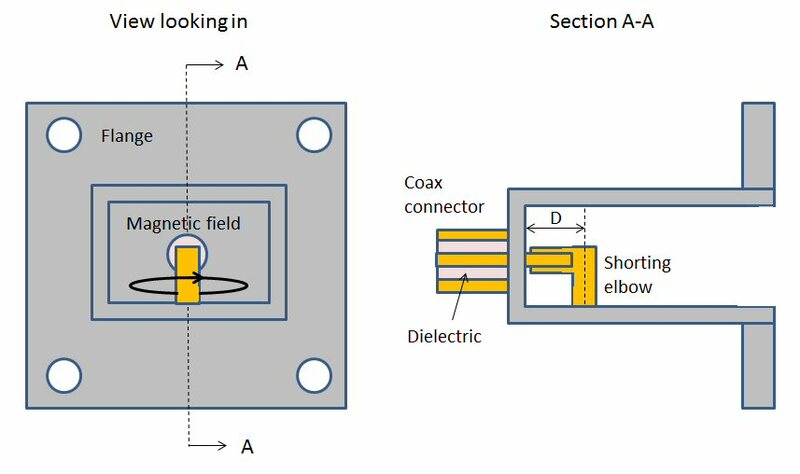 If you were really going to get in the business of manufacturing waveguide-to-coax transitions, you would need to perfect your design using 3D EM modeling to be competitive. 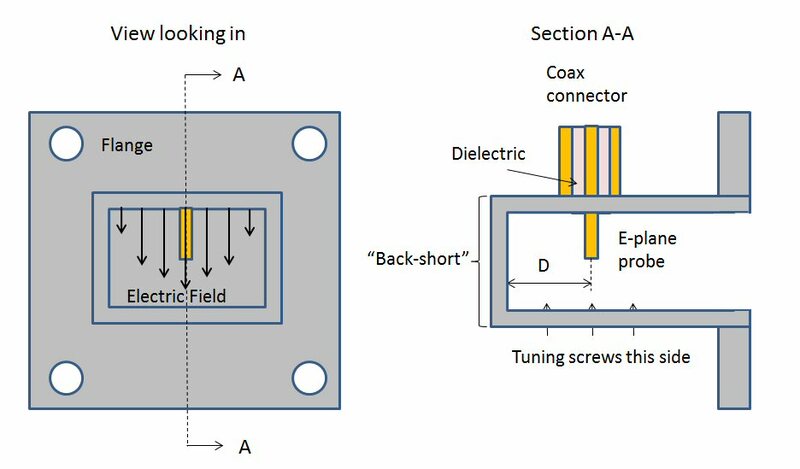 Although the discussion here is on waveguide-to-coax transitions, you can imagine that microstrip, CPW and stripline transitions to waveguide can be made in similar fashion. Indeed, emerging SMMICs (sub-millimeterwave MMICs) will be used in systems that are connected entirely in waveguide, and therefore the transition to waveguide is often part of the microstrip MMIC design. 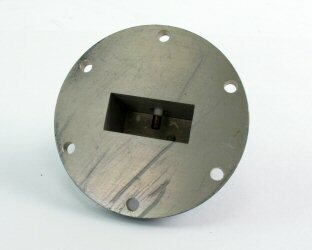 Also, while we are discussing rectangular waveguide on this page, the techniques could be applied to circular or double-ridged waveguide as well. These are also known E-plane transitions, or orthogonal transitions. 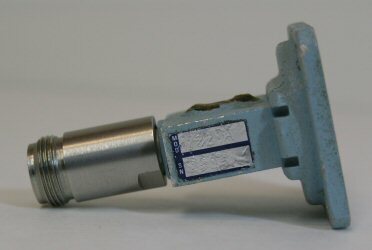 Waveguide is interfaced with coaxial cable by using a simple antenna probe reaching into the waveguide to excite the preferred TE01 waveguide mode. A "back-short" is positioned some distance "D" away from the probe. It reflects EM energy that was propagating the wrong way back toward the probe where it combines in-phase with the incident wave. Thus the probe sets up a time-varying electric field, which is constrained to propagate down the guide. D is usually somewhat smaller than a quarter of a guide wavelength at center frequency. In free space (outside the waveguide), the distance to the backshort would be more than a quarter wavelength but all analyses of waveguides should be done from inside the guide, not looking at it from outside. Note that the wave front in the guide appears to move faster than the speed of light, which is why guide wavelength is more than in free space (remember, phase velocity=frequency x wavelength). For additional explanation, see our page on waveguide mathematics. At the waveguide factory, fine tuning is usually accomplished using tuning screws, by terminating either the guide or the coax into a low VSWR load (say, 1.05:1) and observing the VSWR looking into the other end while sweeping over the waveguide band. The tuning screws are almost always on the opposite side of the guide from the probe. Once the tuning is completed the screws are potted so that they cannot change position. The coax is typically 50 ohms impedance, whereas the waveguide might be 200 ohms. Actually, the impedance of waveguide is a complicated subject, there are three ways to calculate it, and it is a strong function of frequency. Therefore, some tuning must be applied. The tuning can be in the form of screws, or position of the probe, or the distance to the back short. What about the height of the probe, compared to a wavelength? The lower TE01 cutoff of a guide occurs when the broad dimension is a half-wavelength in free space. At the center of the band, the broad dimension is 3/4 wavelength, and the narrow dimension is (typically) 3/8 wavelength. The probe is typically 1/2 the narrow dimension in height, or 3/16 wavelength at center frequency. However, this is also a parameter than can be varied to optimize a design, along with the diameter of the probe and whether it retains a dielectric jacket or is bare. The probe does not have to be of constant cross-section (or could be a flare for example). 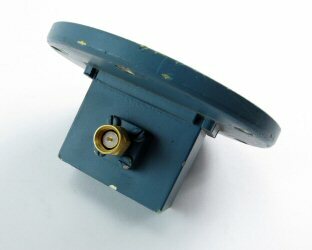 The right-angle type of transition can provide low VSWR across a full waveguide band. It presents an open circuit at the coax interface, something to consider if you were going to run a DC voltage on that line. 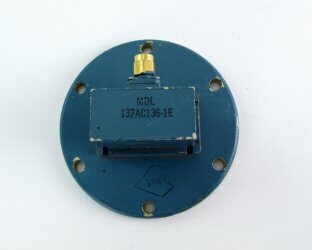 The picture below is of a MDL WR137 to SMA adapter we saw on Ebay. If you look closely in the third picture a tuning screw is evident, below and to the right of the probe. In-line transitions often use a short circuit which sets up a time-varying magnetic wave which couples down the guide. The shorting elbow can be a 90 degree piece of rectangular cross-section as shown, or it could be a whole lot more complex. 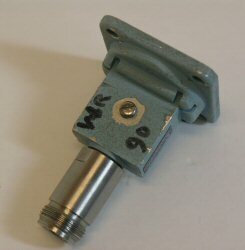 Below are three views of a WR90 coax adapter, with N female, something you might find in a drawer in your lab. Unfortunately, the photographer did not reveal any of the interesting inner bits. You can tell that the coax is centered along the broad wall, and it looks like it is just slightly offset on the narrow wall. The third photo reveals a tuning screw, or it might be where the shorting elbow is held to the guide. In general, in-line transitions do not perform as well as right-angle designs (they have higher VSWR and loss across the band). But they have higher power handling, as the coax is tied to ground which offers a good heat path. You need to consider that DC short circuit on the coax side in your system design. Below the two types of transitions we have discussed are compared in a summary table. * Power handling depends on frequency band. Can be kilowatts, or just plain old watts! If you are looking at waveguide-to-coax transition data sheets that specify 0.4 dB maximum loss, and loss is critical to your system, we suggest you search elsewhere, or contact us and we'll offer some suggestions. "Rectangular Waveguide to Coax Transition Design", Paul Wade, Nov./Dec. 2006, QEX, online. "Coax-to-Waveguide Adapters Meet Needs of Communications Equipment", Richard M. Kurzrok, Applied Microwave and Wireless, unknown date (out-of print trade journal).